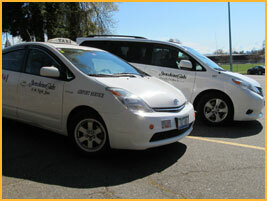 When calling from North or West Vancouver, we can bring you a 5 passenger van to your door. However, if you require a vehicle for 5 passengers, please advice our dispatcher in advance as most of our vehicles are equipped to carry only 4 passengers. This will help ensure the same high level of service can be extended to you and your group. Please note for trips that may require additional space for luggage for example, the space required for both passenger and added accessories, such as luggage, must be factored in too. All vehicles do have limits, so best to discuss with us your requirements to allow us to provide you with the widest range of options for true peace of mind. We grew up in this community and we value the loyalty and trust our clients have entrusted us with for the over 30 years. We are here to serve you, and would wish to see you have a pleasant, comfortable and worry-free trip. That is how we started in this community, and that is how we serve our clients each and every day.